Following Albert Camus’ lead, Radhule Weininger reconsiders the mythical sufferer as a joyful model for us all. 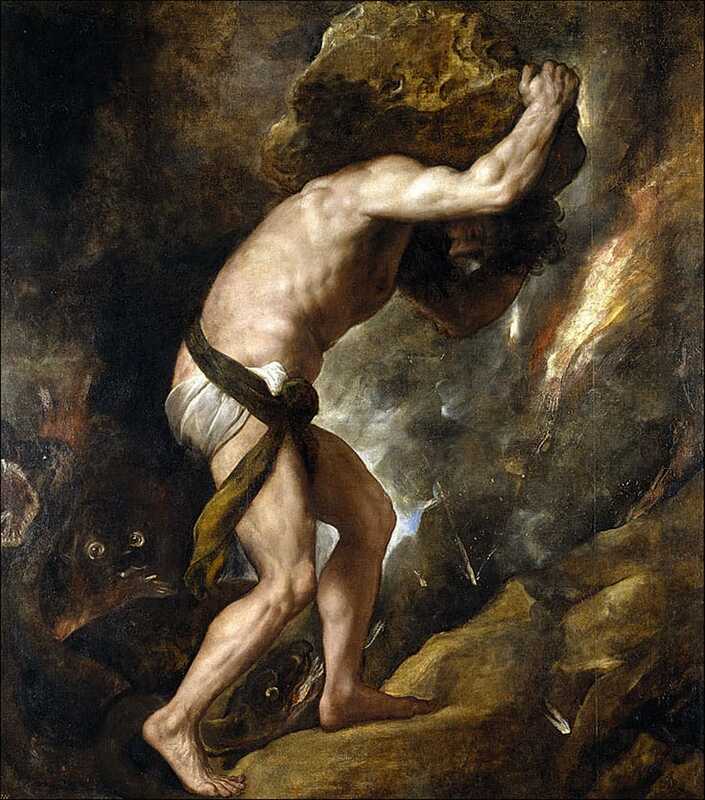 “Sisyphus” by Tiziano Vecellio. Between 1548 and 1549. Oil on canvas. Available via public domain. In these unpredictable and possibly perilous times, many of us experience feelings of heightened anxiety, fear, and even dread. When I contemplate the committed people I know working for the well-being of the planet, for healthcare, the environment, and immigrant rights, I think of Sisyphus. The Greek hero was condemned by the Gods to do a task for eternity. Each day he struggled to roll a huge stone to the top of a mountain only to watch it roll back down on its own weight. Some see Sisyphus as the quintessential sufferer, condemned to repeating hopeless and meaningless toil. Like the mythic Sisyphus, many of us harbor suspicions that the stones we push up the mountain are just about to roll to the bottom once again. Many of us worry that our acts of engagement may be futile. I have come to see Sisyphus an enlightened being. One of the best-known writers to examine this myth is the existentialist Albert Camus. He proposes an alternate and inspiring view of Sisyphus. In The Myth of Sisyphus Camus sees the absurd hero as the one who defies the gods because they have abused their power. Sisyphus’ punishment for speaking out is to effort the stone up the mountain. In Camus’ interpretation, Sisyphus is well aware of his situation, of what led up to it as well as what his future will be. According to Camus, Sisyphus pushes his stone forward with an attitude of knowing, dignity, and even joy, choosing to be present to his task. Knowing that he has no choice other than to shove the stone up the tall and steep mountain again and again, he uses what choice remains to turn and replace sorrow with joy. I see Sisyphus as deeply present with what is; he embraces the absurd, which Camus saw as the result of our desire for meaning in a meaningless world. Sisyphus realizes that in tending to the part, he is tending to the whole. Camus writes “…each atom of that stone, each mineral flake of that night-filled mountain, in itself forms a world.” In engaging with his own world, by showing an attitude of mindfulness, kindness, and complete presence, Sisyphus engages with the entire world. On a recent meditation retreat, I felt myself drawn to reflect on the stone and Sisyphus’s relationship to it. I kept coming back to a fundamental understanding: As we are taking care of our personal world with kind attention, we are also taking care of the whole. I thought of the many people I know who, in the face of seemingly insurmountable obstacles, give their all to work in some small way to help the world. My friend Manny Jesus, a retired professor of psychology, ceaselessly tries to assure the well-being and protection of Mexican-American youths as he engages in battles with city boards. Terrified about the fate of future generations, Nancy and seven other mothers get together while their children are in school to write letters to congressmembers about healthcare, education, and the environment. How would it be if they, indeed if we all, saw this stone in a fresh way? 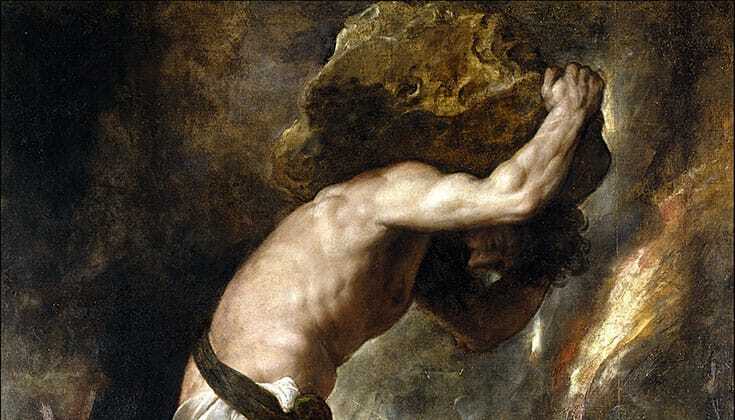 Not as the burden of one Sisyphus pushing his or her personal stone up the hill, but as the common burden belonging to all of us, the rough and heavy boulder of our “human condition”? How would it be if we could, with eyes wide open embrace our “human condition,” deciding to carry this stone for the sake of all of us? Seeing each small act as one of compassion and solidarity, of understanding that everybody has the task of moving the stone of our human condition forward, we give meaning to our lives. In engaging with his own world, by showing an attitude of mindfulness, kindness, and complete presence, Sisyphus engages with the entire world. I have come to see Sisyphus as a bodhisattva. 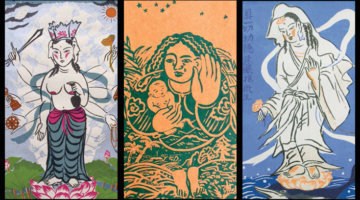 In the Buddhist tradition, the bodhisattva is an enlightened being, who chooses to forgo entry into Nirvana so she can stay with all others, until the last suffering being will be saved. The bodhisattva understands that everything in life is interdependent and constantly co-arising, forever. 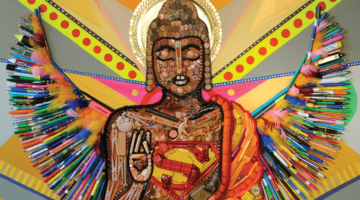 The bodhisattva does what he does out of love and without regard for the immediate outcome. The bodhisattva’s insight that we are all connected, that we are all relatives, gives rise to her deep loving care. Camus’ Sisyphus is joyful. He is filled with gladness as he takes his fate into his own hands and chooses to participate out of his own choice. What happens when Sisyphus walks down the hill, aware of his feet sensing the earth, before he chooses to pick up the stone once again? As my Sisyphus wanders downwards, following gravity, he is in the flow. This moment gives him respite and the refuge to be with what is, now with lightness and vision. As we give to others with love, we begin to transcend loneliness, separation and fear. As I think of my own engagement in this current world, I feel a sense of freedom. I see myself embarking on my various projects propelled forward by my own choice and by the tenderness I feel for others. Originally published by The Santa Barbara Independent; reproduced with permission. Radhule Weininger, MD, PhD, is a clinical psychologist and meditation teacher who first encountered Buddhism in Sri Lanka as a medical student more than 30 years ago. 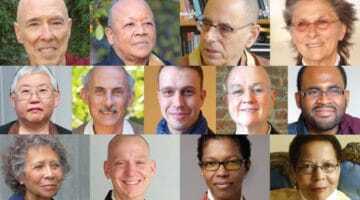 She teaches meditation retreats both in the US and internationally. Her book Heartwork: The Path of Self-Compassion will be published in July 2017 by Shambhala Publications.